You’ve just lost another excuse for not downloading your music in better-than-CD quality. 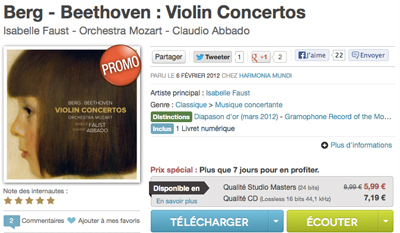 French online music retailer Qobuz is offering more than 2000 albums in 24-bit resolution – not just at the same price as buying an MP3 version, but actually cheaper than the CD-quality downloads. And it’s not the usual ‘audiophile’ stuff – so often beautifully recorded but lacking in ‘yes, but would you want to listen to it’: there’s just about everything in the Qobuz bundle. 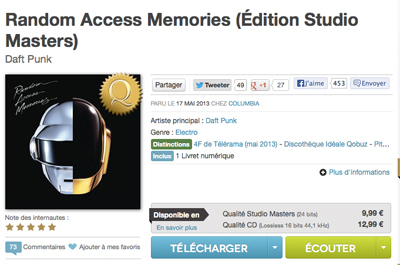 For example, you can get the latest Daft Punk and David Bowie albums for just €9.99 (or about £8.60), against €12.99 (or just over £11) for the CD-quality download. There’s jazz, French artists such as Serge Gainbourg, Carla Bruni and Jacques Brel, through to classical releases such as this former Gramophone Record of the Month, available for just €5.99 in Studio Masters – that’s just over a fiver for a stunning recording. It’s worth mentioning that overall Qobuz currently is the best service around, allowing for multiple redownloads, CD-quality streaming, extensive previews and all this across all imaginable devices 🙂 They ARE THE best at the moment. I’ll second that re the streaming service – I’ve just switched from Spotify to Quobuz for quality reasons and I have to say I haven’t really listened to anything else for a while (the occasional Audirvana fix, but not many). Overall I think it’s not quite as good as Spotify on everything else, but it’s swings and roundabouts, with Quobuz’s interface looking a bit better for example. But CD quality is a huge plus, and well worth the £25 a month I’m now paying (versus £10 for Spotify). Have a try – you can cancel at any time. And if you struggle to register from the UK just send them an email and they should sort it for you – worked for me, I got a quick response. Oh and my French is getting better! How are you able to download from Qobuz? Whenever I try I always encounter a message that says “This music is not available for download in your country.” I have tried on several occasions, with a variety of SD and HD albums. For some titles, you need a VPN able to make your computer appear as if it’s in France, but other titles are fine. When the full Qobuz UK service is up and running there should be no problem.